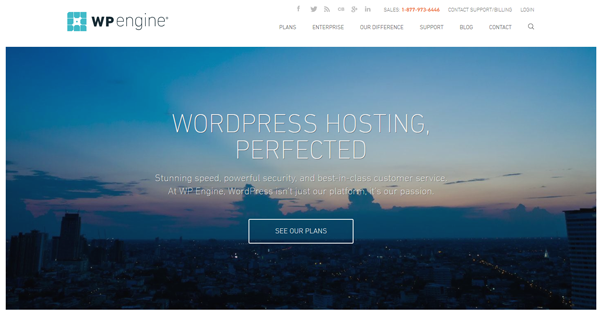 WP Engine specializes in managed WordPress hosting. And because WordPress is all they do, their infrastructure is specifically optimized for WordPress sites. Their customer support staff is comprised entirely of WordPress experts. WP Engine is ideal for enterprise WordPress situations. And, WordPress developers and consultants can utilize features such as transferable installs and billing transfer to streamline their work. For fully managed WordPress hosting, WP Engine is considered the industry standard by many. $29 mo. to $249 mo. While WP Engine does cost more than other hosting plans, my experience has been that if you need premium managed WordPress hosting, it is well worth the cost. The combination of their EverCache technology, proactive security, expert support, and WP development features put them at the top of the managed WordPress hosting list.